Photo by Brian Rock, Niagara UniversityBrian Merrett, C.E.O. 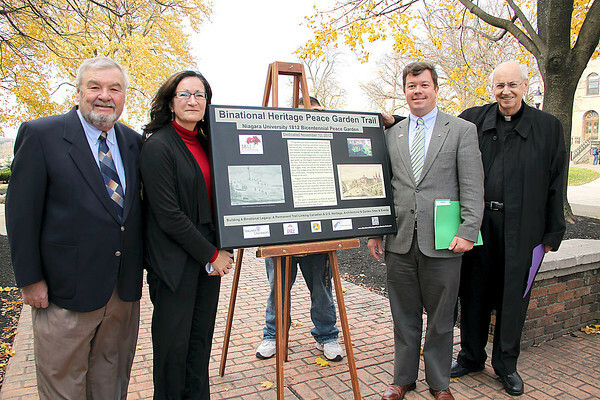 of the 1812 Bicentennial Legacy Council, Arlene White, executive director of the Binational Tourism Alliance, Dr. Thomas Chambers, chair of Niagara University’s history department, and the Rev. Joseph L. Levesque, C.M., NU president, spoke during Monday’s unveiling of a commemorative plaque for the Niagara University 1812 Bicentennial Peace Garden. The garden commemorates the 200 years of peace between Canada and the United States following the War of 1812.